This week we have welcomed our two new interns, Charlotte and Fiona, to the LHSA team. They will both be with us for 10 weeks working on some exciting projects. Here they introduce themselves, and what they've been working on so far. I’m Charlotte the new conservation intern and I’ve had a great first week at LHSA (having just made it from Southampton through the snow!). I’ve had a very warm welcome from the team, and have made a start with surveying a collection of title deeds and other legal papers relating to the Royal Infirmary of Edinburgh. As you can see in the photo this has been a dirty job. 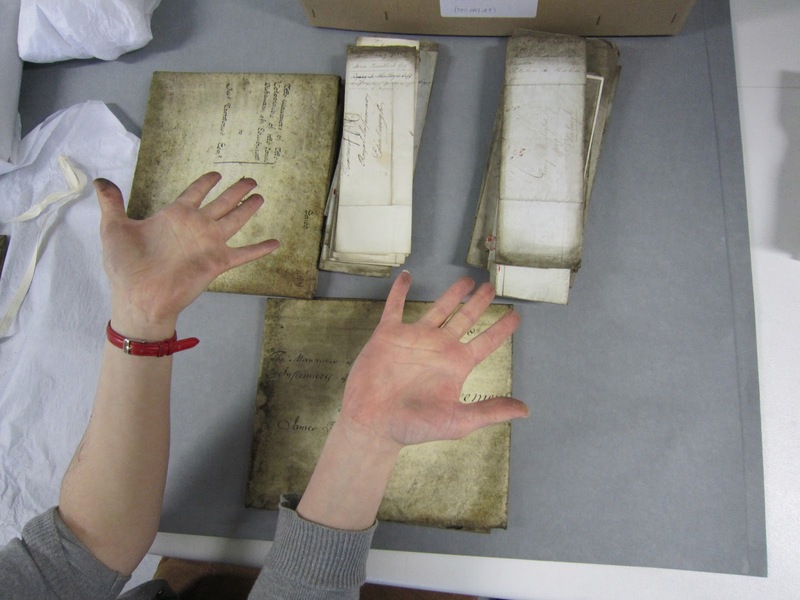 I will be working on this project throughout my time here, mainly focusing on conserving and preserving parchment material. I’m looking forward to getting stuck in and letting you know how I’m getting on. My name’s Fiona and I am the archive intern. 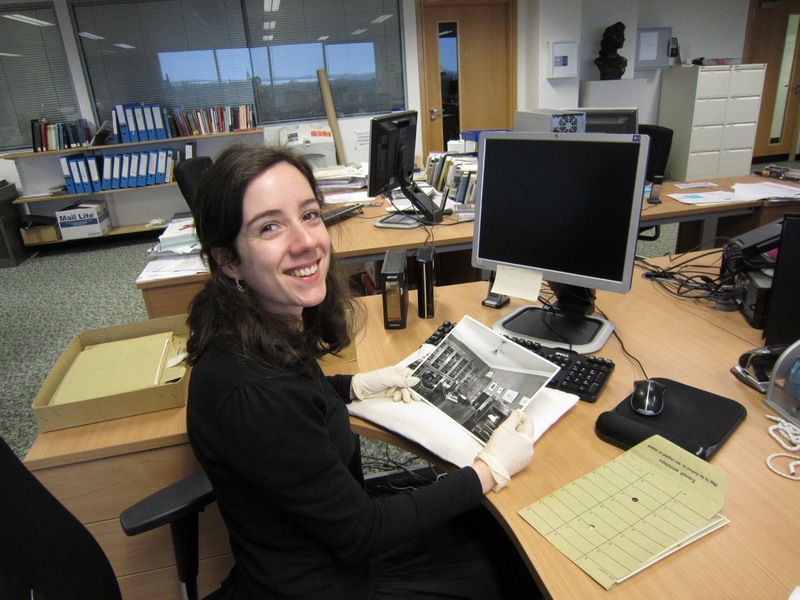 For the next 10 weeks I will be working mainly on a project to catalogue LHSA's photo collection, as well as learning about other aspects of being an archivist. So far I have created inventories for several boxes of photographs. Only about 30,000 photos to get through(! ), but I will be keeping you up to date with my progress through this blog! 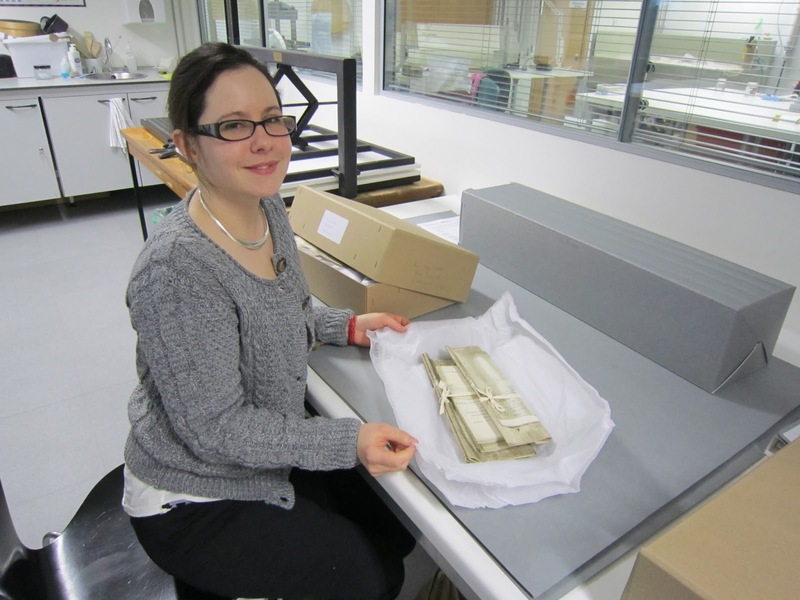 This week, our Project Archivist, Louise, has discovered more about the procedures practised by neurosurgeon Norman Dott. Cataloguing individual case files, you never know what you will find in each one. However, something unusual caught my eye recently. In 1933, Norman Dott operated on a young man to remove a brain meningioma, a slow-growing tumour found in the meninges (the protective membrane which surrounds the brain and spinal cord). The operation was successful, but left a gap in the right frontal region of his skull. The gap left not only a cosmetic effect, but made his brain more vulnerable to injury from blows to the head. 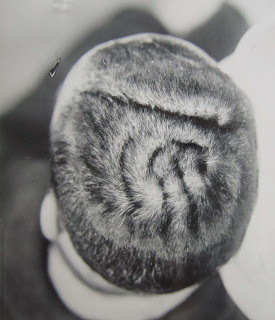 Therefore, the man consulted Dott again in 1934 with a view to correcting the defect. 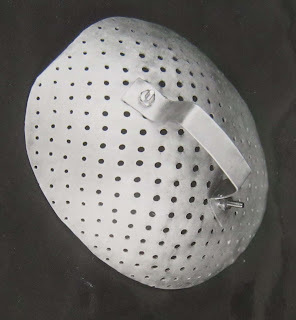 Since the gap was perceived as too large to be filled by a graft of the patient’s own bone, Dott and his medical colleagues considered the alternatives: a celluloid or metal plate was rejected on account of Dott’s fears of adhesion of the brain surface, and a transplant of fresh bone from another individual was considered too hazardous. Instead, it was decided to form a plate from boiled bone, which would be more resistant to penetration by living tissue and also more solid than fresh bone. Before they could make this plate, Dott and his team operated with the purpose of making a cast of the gap in the patient’s skull. Casting at operation used a material called Denticol, which could stand to be sterilised for use in operative conditions. A plaster cast was made of the Denticol impression immediately afterwards so that a suitable plate could be manufactured to be inserted at another operation. 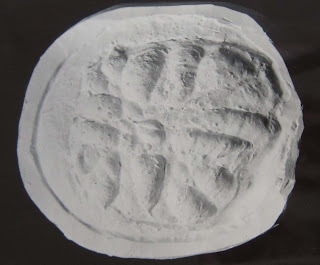 It was decided to make the plate from older macerated bone – bone that had been cleaned of tissue by bacteria – rather than fresher bone that had been simply boiled. When a suitable piece of bone had been cut for the plate, it was fitted onto the cast and then perforated ‘so that it resembled a piece of perforated zinc’. The plate was then thoroughly sterilised in readiness for fitting, which was carried out in a second, shorter operation in which the plate was sutured securely in position through some of the drill holes. However, complications following operation revealed that the plate was not accepted by the surrounding brain tissue – it had to be removed, and a piece of natural rubber was inserted temporarily with a view to replacing it with a bone graft from the patient’s own ribs. Unlike the bone fragment, the presence of the rubber ‘filling’ was tolerated by the patient’s own tissue. One of LHSA’s first readers of 2013 has been researching the life of Dr Isabel Venters, a pioneer of medical education and training for women, using the rich resources of the Bruntsfield Hospital collection. Dr Venters studied medicine at the Surgeons’ Square School founded by Sophia Jex-Blake, became a Licentiate of the Royal College of Physicians in 1894, and was only the sixth woman to graduate M.B. C.M. from the University of Edinburgh, doing so in 1897. She completed her practical instruction at Leith Hospital in the days before the Royal Infirmary of Edinburgh allowed women to receive it. Dr Venters became one of the first residents of the Grove Street Dispensary, the forerunner of Bruntsfield Hospital (opened in 1899), and remained its surgeon for almost 40 years. 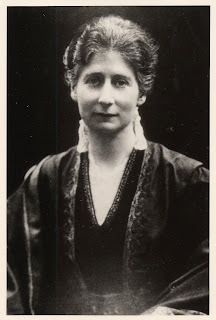 She was the Hospital’s only surgeon during WW1 (at a time when it had 40 beds) and still found time and energy to operate her own practice, and a dispensary for poorer women and children in the Canongate. She remained a trustee of the Hospital throughout, always attending executive meetings besides her medical work. 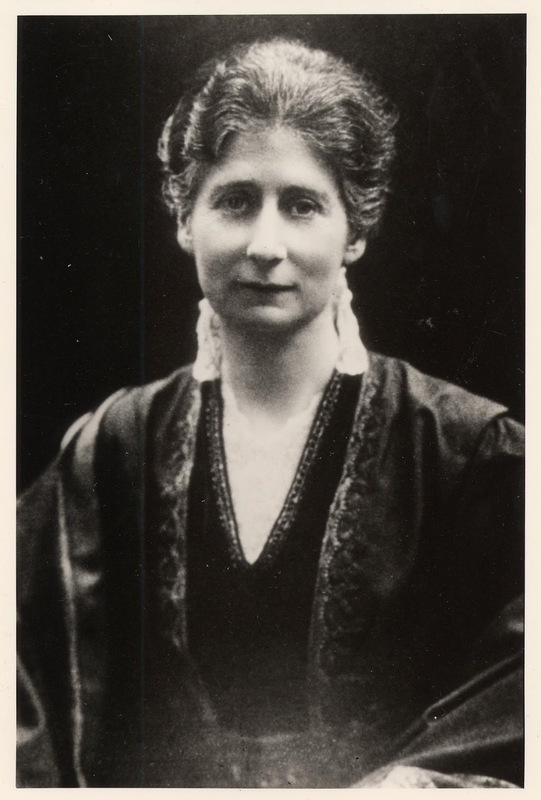 She firmly believed in Bruntsfield’s mission: “a place where women in need might find help from skilled women doctors and where young medical women might have training and opportunity”. A Happy New Year to all LHSA users and readers of our blog. This week there is an update on the case note re-ordering task which has gradually been working through all of LHSA’s approximately 1 million + patient case notes. This has now reached the case notes of the Edinburgh Royal Maternity Hospital/Simpson Memorial Maternity Pavilion (ERMH/SMMP) infant welfare clinic. 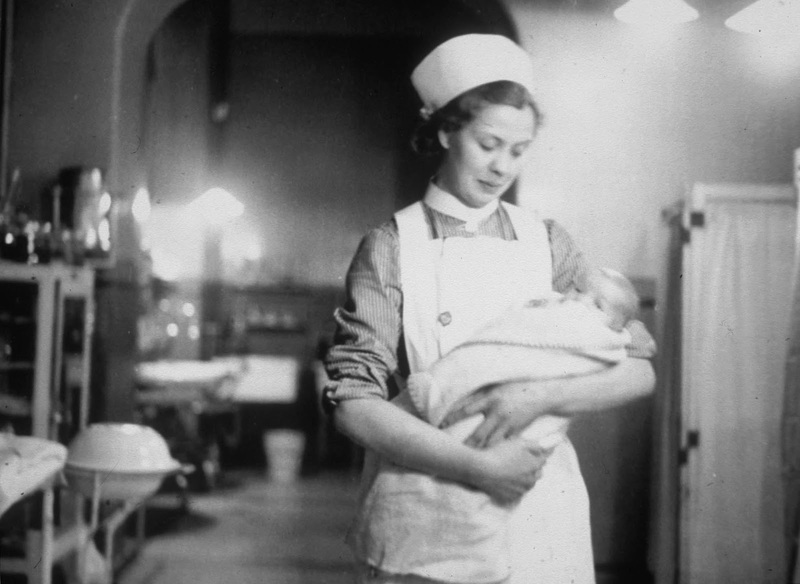 These were case notes produced for babies who required a longer stay in hospital after birth and for infants requiring hospitalisation after birth elsewhere. The date range of the records checked so far is 1933 - 1960, though the main run of case notes is from 1939 onwards. They complement the ERMH/SMMP Obstetrics case notes which date from 1935 - 1954, and contain records of some of the same patients. Looking through them has resulted in a new discovery: a link between previously unconnected patient records relating to a distinct ERMH/SMMP case note collection, described as ‘Paediatrics - Infants Clinic Collection Notes’. This is a small bundle of case notes from 1933 which were found in a cupboard by NHS staff a number of years ago. 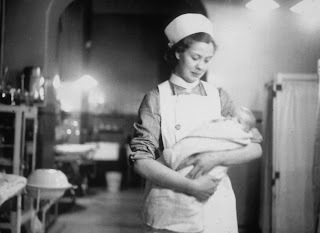 When re-ordering the infant welfare clinic notes, it became clear that for several years, cases where the babies died were removed and put into separate boxes; this includes the year 1933. The style of these case notes is different to later years but it is identical to the case note style of the collection described as the 'Paediatrics - Infants Clinic Collection Notes' and the case note numbers exactly match the gaps in this sequence. The conclusion is that they were once part of the same series! This information can now be added to the catalogue and provided for researchers.